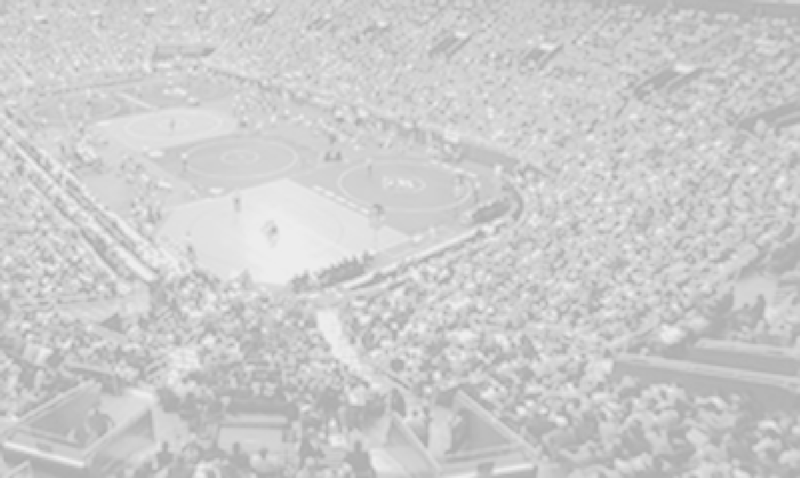 As teams prepared for this second wrestling event of the season and with the word of snow in the air one of the six teams coming from out of the area canceled. For this reason the playing field was adjusted as the gym just needing two mats on the floor vice three and a five team round robin event would leave each wrestler with four matches instead of five. Teams from Fairfax, Prince William, and Loudon all were present making this a quad county event. And some could argue that Freedom HS. and Battlefield HS. representing their own county as the best wrestling teams in its county. So to add team Fauquier to this mixed ingredients you had to known that a scare of a silly snow storm was not going to be anyone’s worries as all wrestlers would be preparing to wrestle on team Fauquier’s home floor. For Fauquier they ended the day by posting a 3 and 1 match record as the fourth of five rounds had all eyes on the Fauquier and Battlefield wrestling match. Not really going to indulge in any other wrestling stories on this day in this article as this match between these two teams would be the main event. The drama leading up to and during the match would even have the referee taking many water breaks as the importance of every call or no calls made would dictate the overall tourney champion. This Fauquier and Battlefield match posted only two pins and one forfeit where each of the other eleven bouts kept the spectators and the coaching staffs on edge. In the end this was a wrestling match that would display drama during each period through each out of bounds stoppage of play for two plus hours. With the score being 27-24 in favor of Battlefield leading into the last bout, one should understand that team bonus points where hard to come by with the team scores still resting in the mid twenties. Fauquier HS and Battlefield HS. are about 20 miles apart and to explain to you that these two wrestling programs are tied together in its development, I might as well pour me a cup of coffee and sit for an hour to discuss it's relationship and development. If not coffee then can I offer you tea? One could say both teams know one another well if not too well. To previous off season Birds O’ Prey wrestling practices that have brought many wrestlers from both teams together. Or you can even look at the other Fauquier youth wrestling programs that might have had wrestlers together on the same team during their juvenile years. Even though both teams are aligned in different VHSL conferences Battlefield being classification as a 6A school and Fauquier a 4A school that it may have sparked a health rivalry between teams-a competiveness amongst everyone that has both teams desiring for the win. Since 2004, when Battlefield opened its doors, this would be the first time Battlefield HS. has recorded a team victory over Fauquier. Yes that is 10 years. Both teams are currently ranked in the state in the combined classification rankings. With teams having strength and weakness Coach Fisher adjusted his line up and moved some of his wrestlers around in hope to counter with strength verses strength against Battlefield. This adjustment created not just one or two featured matches but many. But the two bouts that would jump off the scorer’s table would be the 113 pound match with Daniel Ariola and Matt Asper and the 152 pound match with Garrett Tingen and Justus Weaver which got penciled in on the scores books. Even though Captains Matt Raines and Andrew Smith were wrestling up a weight class Coach Fisher must have known that those two wrestlers can still win for team Fauquier. The Fauquier vs. Battlefield match started with the weight class 126 pounds as Kyle Roche-Fauquier won a 21-7 major decision over Calvin Nisson followed by a fall from Caleb Strum-Fauquier over Roberto Aguilar. So as the first two matches concluded you had Fauquier jumping out to a 10-0 lead. By the time the first of the two featured match slated to roll the team score was now at 14-3 in favoring Fauquier. Eric Russol-08, and Marc Tcheukado-13. To have two number one ranked wrestlers in the state of Virginia 113 pound Matt Asper and 152 pound Justus Weaver on team Battlefield you have to consider those matches will be trouble for the Falcons. But if you also factor that team Fauquier also has two of their best wrestlers also being paired-up with them you cannot over look either one of these matches-and boy both matches lived up to the moment. Even though the box scores showed that Daniel Ariola wining a 7-3 match over Matt Asper this match was tied midway into the third period 3 to 3. Matt Asper actually gave up a third caution penalty point to tie this match as Ariola scored from the bottom to earn a reversal and a set of back points to seal the win. These two wrestlers also met week one at the Elite Opener with Daniel Ariola also winning in another high intensive match. Whereas the second featured match between Garrett Tingen-Fauquier and Justus Weaver-Battlefield also produced some racket in the gym, as Tingen came up short losing 14-9 to Weaver. If I could bottle and preserve this match I would as both wrestlers counter each other moves in strength and intensity. To overcome the sophomore to senior matchup is one thing that Tingen mentally had to prepare for leading into the match where Weaver had the experience of winning. In the end it almost felt like the passing of the torch from old to new. Good showmanship by both wrestlers. But to wittiness Tingen a sophomore putting Weaver a senior on his back two times in pinning combinations during this match was a transition that had the gym erupting and a moment that most people in the gym simply feeling gasped and wondering why the referee would not slap the mat for a pin. Both times Justus Weaver had popped off his back at the last moment or second to avoid getting pinned. I experienced these situations many times during post season play and as individual goals are being set during this beginning season interleague play this early in the season definitely can spring board you through personal goals. Earning a pin is most wrestlers’ goal and doing it to one of the best wrestler in the state of Virginia would have been classified as one of these biggest upset of the year. But even though it did not happen Tingen must feel that his game is improving. I personal would pay money to see a second match between these two kids. As Fauquier falls to Battlefield 30-24 the individual box scores does not do justice on the closeness of this match. Moving forward and having been tested in this manner I would think Coach Fisher will not be worrying about this loss since it does not factor in any sort of season ending result for either team. By closing with a 3-1 record at the Falcon Duals team Fauquier in some sense has started the season strong. Q: What an exciting match between Battlefield and Fauquier, any words that you can say in the reflection of this match. Coach Fisher - We were excited about having Battlefield at the Falcon Duals. They have been training with us in the off-season much of the last 3 years. They have a bunch of great kids on and off the mat, and our familiarity certainly added to a very exciting match and hopefully a continued rivalry. Q: What about bumping Garrett Tingen up a weight class to wrestle Justus Weaver, can you talk about this match as it seemed to bring the house onto their feet. Coach Fisher - Yes, that was certainly the most exciting match of the night. I was excited to see that match, because I knew it would not disappoint. Justice is one of the best in the state and I know that Garrett it is also. What I love about Garrett is he gives everything he has every match, and even though Justice is a top wrestler, and is in the next weight class up, Garrett went after him with the sole purpose of getting the pin as he does with everyone he wrestles. Garrett, like the honeybadger, doesn’t care! And true to form, Garrett showed that he can put anyone on their back at some point, and in this case he did twice. Unfortunately he did not get the fall call either time, but nonetheless, I was definitely pleased with his effort. Q: Now that your team is through two events you have two wrestlers that have jumped out to an undefeated 9-0 record. Are they wrestling well right now? Coach Fisher - Yes, Daniel and Matt both are 9-0, and have already wrestled some tough competition. They are both looking really good, and are working hard in the room to continue to improve. Q: The next three dates seems to have the team Fauquier attending some highly ranked events. Is the team ready for the next three weeks? Coach Fisher - Many. We have Beast of the East this coming weekend, and Mount Mat Madness the following weekend. Then we will see Robinson again the weekend after that at Mayhem at Millbrook. So, yes, we have 3 solid weeks of competition ahead of us. I see the team continuing to improve. I thought Andrew Smith had a great tournament this weekend and really improved from the Skyline Elite. Kyle Roche had similar improvement, and is looking like he is hitting stride. Justin is another guy that has really been coming on these last couple weeks. 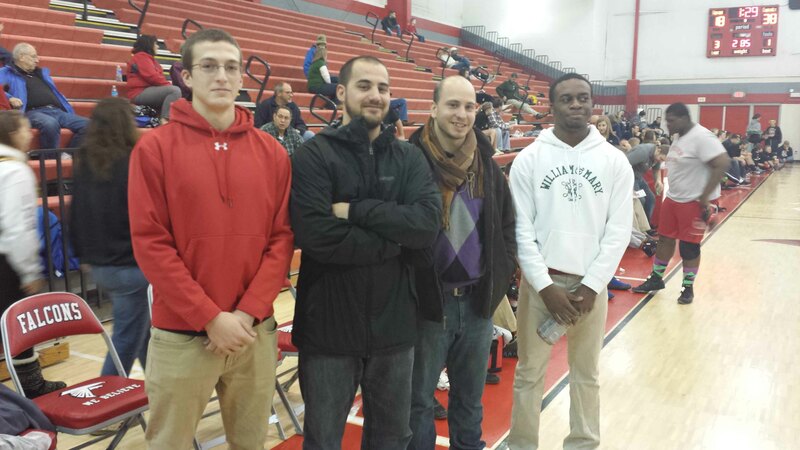 Likewise so has Vito Camarca, and Trevor Marable. I have also been seeing huge improvements in a couple of our young heavier weights Tommy Palmer and Tyler Devers. 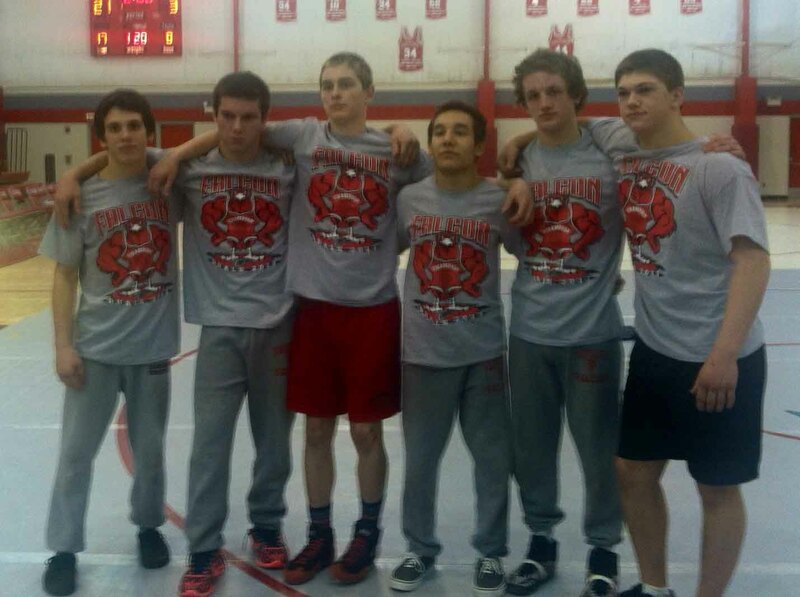 To highlight the awards six Fauquier wrestlers earned Champion status at the Falcon Duals as these wrestlers posted an undefeated record in their weight classes. Congratulations to 113 lbs Daniel Ariola, 126 lbs Kyle Roche, 138 lbs Matt Raines, 145 lbs Garrett Tingen, 160 lbs Vito Camarca, and 182 lbs Andrew Smith. 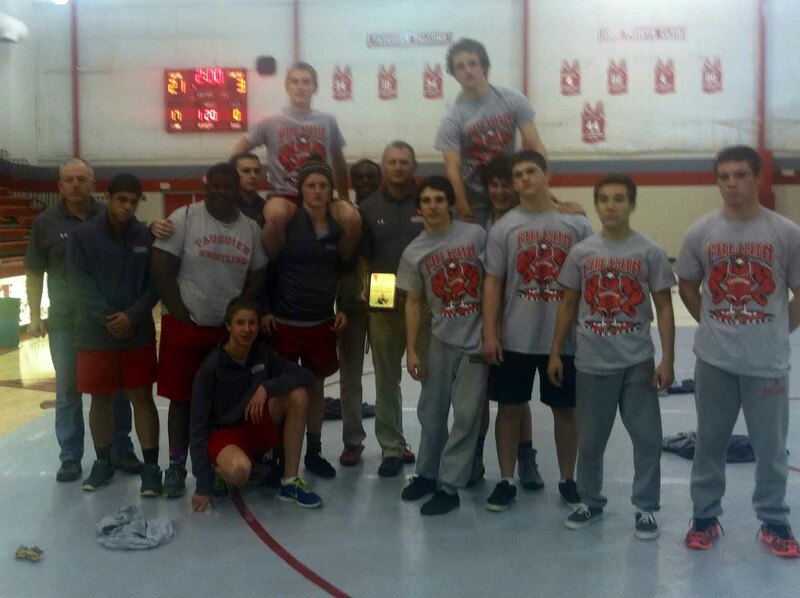 Fauquier wrestling also took 2nd place status with their record as Battlefield won the event. Next on the calendar you will find team Fauquier traveling to the Beast of the East in Delaware, Newark DE. as this is classified as the 3rd toughest tournament in the nation. The team is expecting to leave Friday for this out of state event that will take place on Sat., 21 and Sun., 22. Then the following week after Christmas on Dec. 27th and 28th the team will travel to Mount Mat Madness Univ. of Maryland Baltimore Co. as this event is currently ranked as the 7th toughest tournament. Below are the team and individual results from the Falcon Duals. Match Notes: Fauquier open up the season by winning big as they post 11 wins with 5 pins. Match Notes: Fauquier rolls to a win with a 11-1 record with 3 pins. Match Notes: Fauquier wins a close match agains Freedom 44 -24 and improves to 3-0 on the season. Team went 9-4 with 5 pins in match. Match Notes: The Falcons went 6-7 with 1 pin.